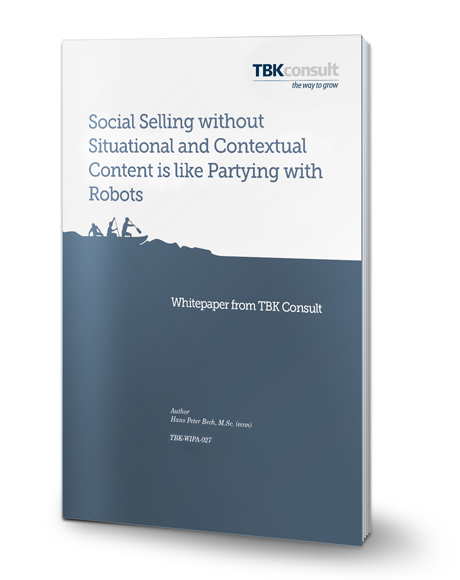 Over the last ten years, terms such as “social selling” and “content marketing” have entered the revenue generation vocabulary. Some argue that they have changed the disciplines of marketing and sales fundamentally, to which the author of the whitepaper don’t agree. The Internet has certainly brought us new communication channels and learning how to use and navigate these channels are obviously very important in the strive for improving the productivity of our marketing and sales activities. The whitepaper defines the three types of content and explains how you decide when to provide your potential customers which each type. It then introduces the concept of marketing and sales as the facilitation of the buyer’s journey and explains that the nature of your business model determines to which degree you can take advantage of social media. The whitepaper recommends how to build the basic foundation for using social media for sales purposes and concludes that it must be an integrated and managed part of your marketing mix and should not be left entirely to the individual sales person’s own initiative.